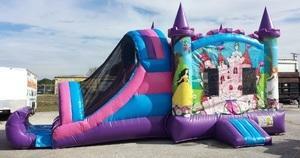 Princess combo inflatable for party rentals in lakeland, winter haven, bartow, auburndale and all central florida locations. 4 In 1 Purple Princess Combo For Dry Use. bright colors as well as activities for your little princess Party. Climb Area and a 2 lane slide that's always ready for fun in the sun. area as well as all surrounding areas since 2004.